Lovely photos! We're bracing for the same weather later today here in London... enjoy your snow day! Beautiful pictures Sylvie. we are expecting the same later today. Very pretty to look at, but not so nice to get around in! How lovely and what nice photo. It all looks rather nice here too, although it all turns to mush underfoot. Sloe gin - yum, think we might follow your example and have some of my redcurrant vodka. Hilary, we did have a lovely day. There's a snow woman outside my window to prove it. Stay warm in the capitol! Marie, I just put my hiking boots on and went for a lovely walk. It was perfect. It's fine as long as you stick to walking! Choclette, no mush here yet. Just six inches of perfect crunchy snow. I'm dreading the big melt though. pigpigscorner, I think we got most of it already up here, but it sounds like it's yet to come for other places. Wrap up warm and stay safe. i love sloe gin and i would really love to make it, but where does one find a sloe berry...? Incrediblycrunchyflavor, you find them in the hedgerows in autumn. They are the the fruit of the Hawthorne, and you should pick them in late October or beginning of November. Beautiful photos, a perfect day for sloe gin! 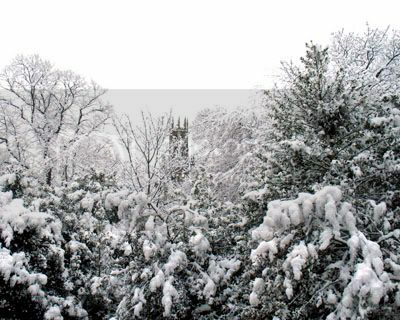 Gorgeous and I am pleased to hear someone has been enjoying the snowy weather after all the gripes! I looked for sloes recently but wasn't sure about the berries I saw, lol! Happy New Year Sylvie, and enjoy the snow. We got a big dump overnight! I like your tip on popping them into the freezer if there has not been a frost. I need to find myself somewhere I can pick sloes. Your photo brought me here...it is gorgeous. Your trees are as snow laden as ours in Northern New York! 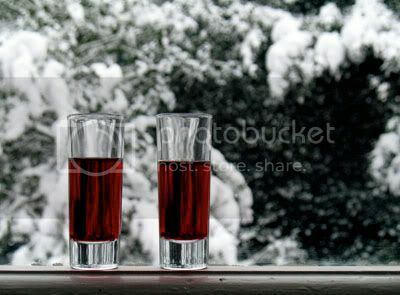 Beautiful photo with the ruby red and the snow... sloe gin sounds delicious!! !